The Wanchese office has been busy, with the help of many others, maintaining and establishing regional living shoreline projects. 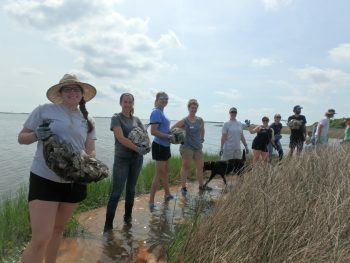 In early June, North Carolina Coastal Federation staff, oyster shell recycling volunteers and volunteers from the North Carolina Aquarium on Roanoke Island teamed up to build an oyster reef right outside of the Wanchese office. This oyster reef was built using oyster shell that had been collected over the past year from the federation’s oyster shell recycling initiatives. Oyster shell recycling volunteers saw the oyster life cycle come full circle during the building of this reef. Most of the shell was recycled from local restaurants through the federation’s pilot “Adopt-a-Restaurant” oyster shell recycling program. Over the past year, dedicated volunteers have picked up oyster shell from Outer Banks restaurants Blue Water, Coastal Provisions Oyster Bar & Wine Bar Café and Sugar Shack and have transported the shell to a centralized location to be used for reef building purposes. Before the reef building, the volunteers learned the importance of putting oyster shell back into the water to create a place for free-floating oyster larvae to attach and grow upon. The volunteers were also told that the building of the reef is the first construction step made toward building a living shoreline demonstrative site. The 100 linear feet of oyster reef will be accompanied by three other living shoreline techniques to showcase the different options for erosion control and marsh grass restoration. 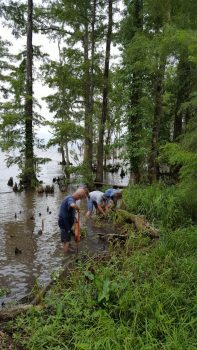 More recently, another living shoreline was completed in Edenton with the help of landowners Maridale Jackson and Manu Suarez. The structural part of the living shoreline was completed in early spring by Backwater Environmental with the planting component finished in early June. This living shoreline project is unique as it is within a fresher maritime forest near Drummond’s Point in Edenton. Unique native grasses were planted landward of the structure and among bald cypress trees with guidance from Wetland Plants Inc. These include fringed sedge, arrow arum and lizard tail. More living shoreline projects are expected to be built this summer in the Outer Banks area. The largest is a proposed living shoreline protecting a road in Kitty Hawk from Kitty Hawk Bay. This project includes five waterfront properties and is still in the permitting phase but is expected to be completed by late summer. Learn more about living shorelines at the Living Shorelines Academy and at nccoast.org/livingshorelines.